Reprinted with the kind permission of The Antiquer, November 2003. Although the spirit and styles of the era were felt before and after, the canonical Regency was a brief nine-year period from 1811 until 1820. It was during this time that King George III (of American Revolutionary War disgrace) was deemed mentally unfit to rule and his eldest son, George Augustus, Prince of Wales (later George IV) was made Prince Regent to rule in his place. Regency England is perhaps best known from the novels of Jane Austen and the more current Regency romance books they inspired. If we were to trust Ms. Austen, we would believe that the Regency was a time of correctness and refinement, peopled by individuals concerned with questions of goodness and morality. Among the upper crust, the reality was much less noble, and for the aristocracy and elite the Regency was an appallingly indulgent era characterized by shockingly naughty behavior. During the Napoleonic Wars and following Napoleon’s 1815 defeat – when British spirits ran high and the Industrial Revolution was changing the face of Britain’s economy – members of refined society placed a high priority on civilized living, but their definition of “civilized” was skewed and the Regency was a time of outrageous contradiction when elegance supped cheek-by-jowl with socially acceptable vulgarity. While the arts and refined living were lauded by the haute ton, the ton also indulged in profligate spending, frivolous social inanities, and general debauchery. The Prince Regent, Prinnie as he was known, was truly the prince of paradox. By the time the Regency was suggested in 1788, he had already established himself as a man capable of infinite charm, intelligence, and fine manners; he was also a grossly overweight hedonist, a drunkard, and a notorious lecher. From his headquarters at Carlton House, located off Pall Mall in London, Prinnie surrounded himself with a circle of friends known as the “Carlton House Set,” which included, among others, Prinnie’s Whig friend and drinking buddy Charles James Fox; playwright, politician, and fellow boozer Richard Brinsley Sheridan; and the illustrious Duchess of Devonshire (with whom the Prince Regent was rumored to have had an affair). The Carlton House cadre – a glitzy mixed bag of effetes, fops, rakes, rogues, scholars, gamblers, duchesses, society hostesses, politicians, pugilists, and eccentrics – was powerful, and their social practices and attitudes, exploits and amours, led Regency society into a glittering era of decadence and scandal. The Prince Regent’s character was impetuous and Bacchanalian. His licentiousness and promiscuity excused similar unrestrained behavior and bed-hopping among the ton, and his love affairs read like a multi-part mini-series: beginning with a grand passion for a young actress who played “Perdita” on stage, moving on to numerous liaisons (including some of his friends’ wives and women many years his senior), climaxing in a clandestine and illegal marriage to the fleshy Mrs. Fitzherbert (whose house was connected to Prinnie’s Royal Pavilion in Brighton by an underground passage), and tapering toward denouement with his arranged marriage to the unsightly Princess Caroline of Brunswick (who has been described as blowsy, bad-tempered, loud, and dirty). 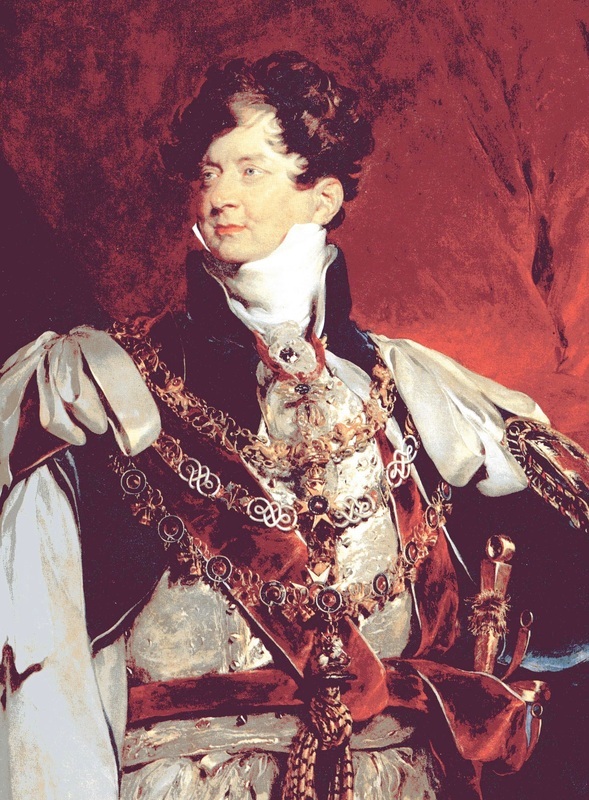 When Prinnie finally became king in 1820, he created a public relations debacle when he tried to prevent the by-then estranged Caroline from attending his coronation. This was followed by unsuccessful divorce proceedings through which Caroline topped his majesty, if only by comparison, in public esteem. Other key players in the Regency’s melodrama were equally colorful and disinclined toward decorum: Lord Byron (whose numerous affairs included a disastrous fling with Lady Caroline Lamb and an alleged incestuous relationship with his half-sister), Percy Bysshe Shelley (who left his wife Harriet to elope with Mary Godwin, creator of Frankenstein), and Lady Oxford (whose numerous children were known as the “Harleian Miscellany” because each bore a striking resemblance to one or another of their father’s friends). There were also Lady Lade (reputedly a mistress of the Regent’s brother, the Duke of York), Colonel George Hanger (an intelligent illiterate whose gypsy wife left him for a tinker), and the infamous Earl of Barrymore (known as “Hellgate” for his wildness). In a milieu of social activity, lavish parties, routs, balls, and ferocious gossip, the Prince Regent and the dissolute beau monde were seemingly oblivious to the industrial progress, working class rebellion, and violent social unrest that rocked the rest of the nation. The Industrial Revolution was expensive, and the war against Napoleon was a weighty financial yoke on the shoulders of the sceptered isle: both wreaked havoc on the British economy. It was not, however, the upper classes who suffered, and the struggling poor responded with hard line rioting. In 1811, just as the Prince Regent was enjoying an opulent inaugural celebration at Carlton House, the Luddite rebellion broke out in protest against unemployment caused by new Industrial Age machinery. For several years strikes and riots took place throughout England. Violence was not restricted to working class rebellion, and street crime was prevalent during the Regency. There was no centralized police force until the Metropolitan Police Act was passed in 1829, and regular constabularies in other areas of the country were uncommon until even later. Pickpockets, muggers, and footpads were abundant on city streets, and walking alone was a high-risk situation: Prinnie and the Duke of York were once assaulted and relieved of their valuables as they walked near Berkeley Square. Coach travel on open roads was also a risky business, as highwaymen were ever-present, brandishing pistols and calling out the familiar “Stand and deliver!” Forest bandits and wreckers (who deliberately lured unsuspecting ships onto rocky coasts) were additional sources of Regency crime. There were also con men of every stripe, and it is small wonder that most Regency gentlemen carried swords and had their servants carry pistols. At the head of it all, sat the obese Prince Regent, who may have been popular within his privileged circle but who provoked hatred and lampooning from the rest of his subjects. Examiner editor Leigh Hunt summarized public sentiment when he described the Regent (on his fiftieth birthday) as “A libertine over head and ears in debt and disgrace ... a man who has just closed half a century without a single claim on the gratitude of his country or the respect.” Thackeray wrote, “He was the first gentleman of Europe! There is no stronger satire on the proud English society of that day, than that they admired George.” Public opinion notwithstanding, Prinnie was an arbiter of architectural and interior design and one of Britain’s greatest patrons of the arts (favoring novels by Sir Walter Scott and Jane Austen and purchasing paintings by John Constable, Joshua Reynolds, and Thomas Gainsborough). He was fundamental in establishing the National Gallery and the Royal Society of Literature, in construction of the Royal Pavilion at Brighton (once considered bizarre and now a national treasure), in the redesign of London’s West End, and in the creation of Regent’s Park. Regency styles were unprecedented in British fashion, with dandyism a frontrunner for well-groomed men. George “Beau” Brummell, a quasi-aristocrat first noticed by Prinnie around 1794, was the progenitor and king of the dandies. Known for his manner of dress, elegant manners, and clever repartee, he elevated personal hygiene to an art form. Brummell’s vision of sartorial perfection was dependent upon clothing of the finest cloth and cut, tight knee breeches (which sometimes made sitting next to impossible), and starched neckties (the height and stiffness of which were said to have “created a sensation equal to Waterloo”). The finished look of a Brummell-style dandy took hours to effect, and Brummell’s own toilette was so extensive that honored members of the ton were actually invited to watch him dress. Virginia Woolf wrote of him, “Empires had risen and fallen while he experimented with the crease of a neck-cloth and criticized the cut of a coat.” Brummell ultimately fell out with Prinnie, and gambling debts sent him scrambling to France where he died in a madhouse. Women’s clothing highlighted the natural contours of female anatomy (corseting and hoops were definitely out), and haute couture for Regency women was defined by high waistlines, daring décolletages, and flimsy fabrics (it has been noted that some ladies dampened their petticoats to emphasize their curves). In many ways, the Regency had a more French than English flavor. Pre- and post-Waterloo pretensions of fashion and taste were decidedly Continental. The ton filled their grand homes with French furniture, their cooks prepared the best French foods, and they drank copious amounts of French wine and brandy. Prinnie often decorated in the French style, and he collected Sèvres porcelain, French clocks, and other costly French objets d'art. Even during the war, smuggling from the Continent was commonplace, as the Regency elite would not allow even Napoleon to get in the way of their requisite social necessities. The Prince Regent went so far as to adopt Napoleon’s favorite colors (scarlet and gold) as his own and used them extensively in the 1815 redecoration of Carlton House. Even the indecent waltz, popular in France and in which a lady was held in her partner’s arms, became all the rage on the other side of the Channel. As society grew more and more egalitarian, behaviors became increasingly uncensored. Established rules of etiquette and precedence were changed at will, particularly by the Regent, and hypocrisy at Court and within “refined” society was accepted as a matter of course. Over-expressions of sentiment were routine (Prinnie once staged a particularly “bloody” fake suicide attempt in persuading Mrs. Fitzherbert to become his mistress). Women gave vent to temper tantrums, and men thought nothing of bursting into tears in public. Weeping was believed to be useful in winning the favors of reluctant ladies, and gentlemen were known to up the ante of pursuit by sprinkling their loves notes with artificial tears. The major font of inspiration for Regency design derived from the structural and ornamental elements of Greek and Roman antiquity and the concurrent Empire and Directoire styles in France. Regency design was heavier than the preceding Georgian, which reflected British interpretations of Palladianism, Rococo, and Neo-Classicism. Although French and Neo-Classical influences were strong, a fascination with Oriental art and Eastern design was widely expressed in Regency architecture and interiors, notably in the style and furnishings of the Brighton Pavilion, built by John Nash in the Indian style. Design elements ranged from Egyptian motifs to Chinoiserie (including painted and japanned black and gold lacquer pieces) to French-style furniture ornamented with brass inlay marquetry. Flat furniture surfaces were highlighted by exotic wood veneers and application of metals or painting. The finest Regency furniture was distinguished by sturdy design, superior craftsmanship, and ornamental purity. The Regency ton may have been little more than a group of bored and unruly members of the patrician and wealthy elite. Obnoxious, self-absorbed, and generally out-of-control, their recklessness was fated to be short-lived. Regency tastes, attitudes, and behaviors were effectively erased by the time of Queen Victoria, who established a strict moral code for all British citizens that was bolstered, in contrast to the Prince Regent’s conduct, by her own unfailing example.